How do you know if you need a well water filter , Reverse Osmosis purification or a whole house water system ? What can you do to find the best water quality treatment system for your home and where do you start? We have these helpful and important steps to find the right water treatment eqipment for your home. We design our water softerners private well treatment systems drinking water purification equipment whole house water systems and in-door air purifiers for safety and performance to provide assurance that our certified water treatment products will do what it says it is going to do. If you are wondering what contaminants may be in your water, you can start by getting a copy of your water quality report (called a CCR or consumer confident report) from your local water utility/authority (in the U.S.). If you are unable to get your report or if you have a private well, you may want to consider having your water tested by a certified lab. BE CAREFUL TESTING YOUR WATER ONSITE WITH A DROP TESTING KIT IS NOT RELIABLE AND THEY ARE DESIGN AS A SCARE TACTICT. (this tipe of test are not reliable) Need Your Water Tested . Once you know what contaminants are in your water , you can better find a water treatment solution that is certified to address your water quality concerns . It’s important to understand that not all filters can reduce all contaminants. Based on the water report or your water testing results , you can decide what contaminants you want to reduce and/or eliminate in your drinking water . A number of water treatment solutions are available. They range from whole-house systems that treat all the water in your home, to filters for specific areas such as the kitchen faucet. Some reduce only one contaminant while others reduce many. Ask what is inside the system, knowing what is inside the system your are considering to buy is the most important piece of knowledge you can have on your side. Not all systems are created equal. A water softener only takes care of calcium and magnesium only, unless is design to take care of multiple filtration uses. Point-of-use (POU) systems treat the water you drink or use your water, and include faucet filters and reverse osmosis (RO) systems. Reverse osmosis systems are the only NSF certified systems that reduce fluoride and nitrate; and Reverse Osmosis systems are the only ones that are NSF certified to reduce both lead and copper. Whole-house/point-of-entry (POE) systems treat the water as it enters a residence. They are usually installed near the water meter (municipal) or pressurized storage tank (well water). Whole-house treatment systems include UV microbiological systems , water softeners or whole-house filters for chlorine, taste, odor and particulates. Custom-designed water conditioning systems for each specific application and is the way to go. All customers have varying needs and water quality expectations . A household of eight requiring water hardness and chlorine removal will need a significantly different system from the retired couple next door with a desire for a scale-reduction system . Our expertise allows the flexibility in system design that will give you and trouble free and lower operation cost than any other water softener in the market. Sizing a residential water softener system may seem simple but there are many factors to consider. A family of five that uses about 375 gal of softened water per day (75 gals per day per person) at an influent hardness of 20 grains per gallon results in a daily softened-water capacity need of about 7,500 grains. A 1-cu-ft 32,000-grain softener seems to fill the need perfectly because it will theoretically last four days between regenerations; however, the 32,000-grain rating is based on an inefficient salt setting of about 15 lb. and nets an efficiency rating of only 2,133 grains removal per pound of salt (32,000 divided by 15). Our Water Softeners are programed to regenerate with 6 lb. of salt per cubic foot of resin. A well-designed 1-cu-ft softener regenerated with 6 lb. of salt should provide a more environmentally friendly capacity of about 24,000 grains. This works out to an efficiency rating of 4,000 grains removal per pound of salt. This lower salt setting results in a nearly twofold salt efficiency rating, provides many benefits and in most applications will have few, if any, drawbacks. 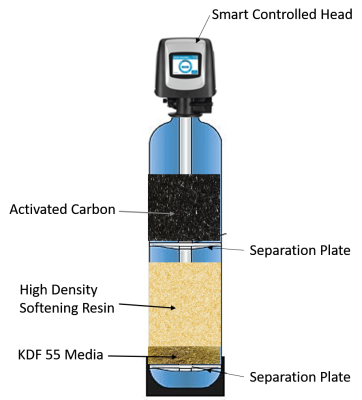 Thus, from an efficiency standpoint, the 1-cu-ft water softener is now capable of removing about 24,000 grains, or Water Softening Capacity of 1,200 gals (24,000 grains capacity divided by 20 grains influent hardness) before needing regeneration. Based on the 1,200-gal capacity divided by 375 gal used per day, the 1-cu-ft water softener will need to regenerate about Four days. Now let’s consider the type of regeneration initiation and required reserve capacities. Time-clock-initiated water softeners are generally less efficient, especially in residential applications, and have become far less popular. Installing a single-tank meter- initiated water softener in a residence requires a certain amount of reserve capacity. This is to account for the set delayed regeneration time, usually 2 a.m., and the amount of capacity that is needed to maintain soft water during the period between the call for and the actual start of regeneration. The water softener, for example, may receive a need-to-regenerate prompt nearly 24 hours before it is able to actually perform the regeneration. This is because the set capacity may be reached at 4 a.m., but the delayed regeneration function will prevent regeneration until 2 a.m. the next morning. Regeneration is delayed to a low-volume timeframe like 2 a.m. to lessen the use of hard water and to prevent hard water from filling the water heater during regeneration when soft water is not typically available. Reserve capacities are generally calculated as one full day of soft water use by multiplying the number of people in a household by the 75-gal average daily soft water use. Variable reserve functions available on our modern digital valves help to mitigate this issue by automatically adjusting the reserve capacity based on historical water-use data. Simply Pure Water Softeners have evolved to be the most efficient water softener Tampa systems in the market Guaranteed!